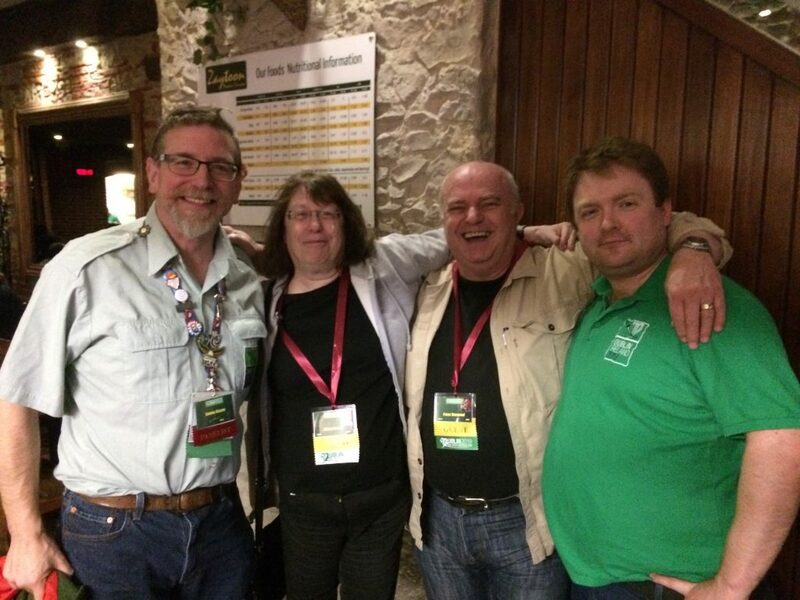 James, Dublin 2019 GOH Diane Duane, Peter Morwood and Dublin 2019 treasurer JC. By James Bacon: After the ceol and the craic of Friday night at Irish DiscWorldcon, I slept well and made an early breakfast with Vanessa, before heading to Kent Station, Cork for the 10.40 departure, but as we go we are wished warm and pleasant farewells from Siobhan the Irish DiscWorldcon Chair. Octocon beckoned and once we arrived in Dublin, the trip from Heuston Station to the Camden Court Hotel, in the City centre, on the south side of the Liffey was quick in a taxi. The warm welcome at Octocon was amazing and as we walked in we are greeted, and soon joined other committee members at the Dublin 2019 table. We were also met by Janet O’Sullivan the chair of a Octocon and Sakura Perez the programme director as we receive our memberships and I hear that membership has hit 350 people, which is a fine figure for Octocon. I thought that I’d get into some programme but suddenly I’m catching up with so many folk that over two hours passes by, our table is strategically placed near the bar and I encounter many friends and new fans, and also pleased to listen and hear the excitement for the Dublin 2019. I look to hand out some ribbons, which are popular here, but new, and so any are well accepted, I have a variety of old ones, and they are eagerly received. Mike Carroll busy signing comics. I take a moment to catch up on a presentation, one by Michael Carroll. 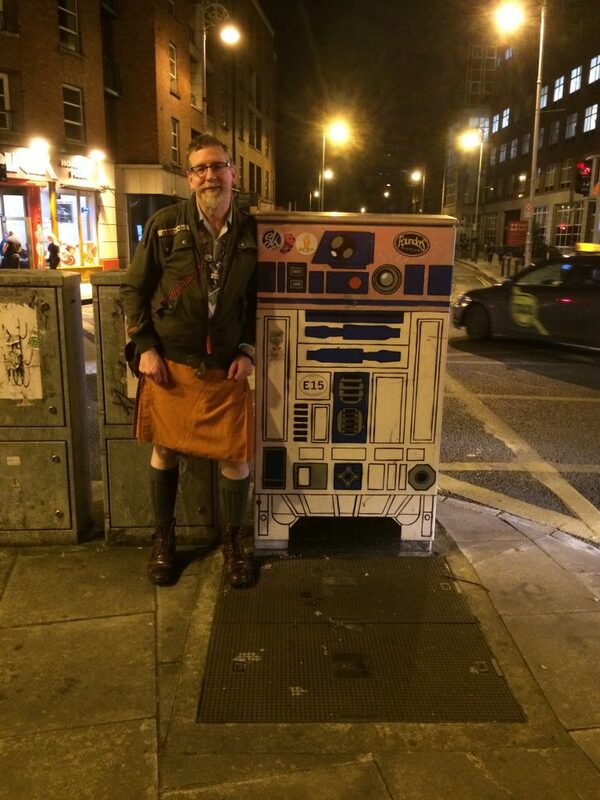 Mike is a writer and long-time fan here in Dublin, who has written prose, script and comic. 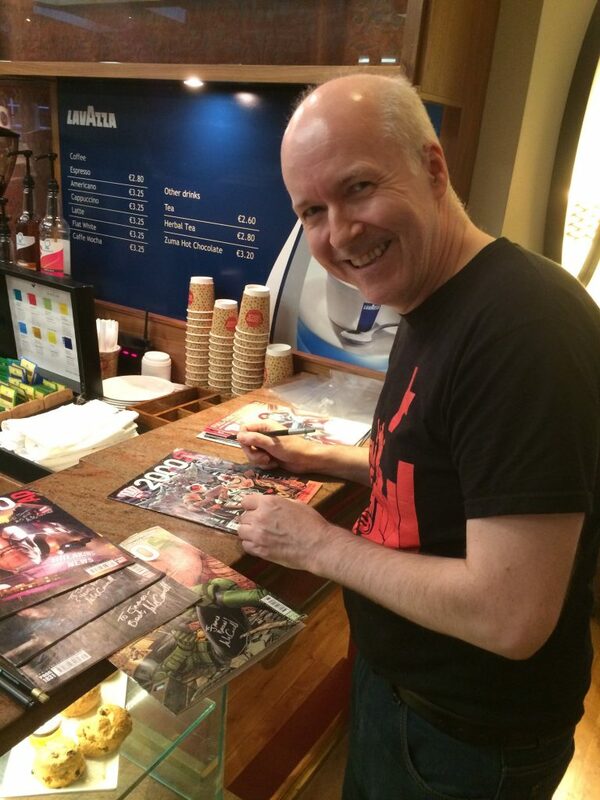 He has written over 100 episodes of Judge Dredd for 2000AD, amongst a wide variety of work. After talking a little bit about one of his recent stories in that comic, he begins an incredible motivational and pragmatic presentation about writing. I am fascinated, his sound bites and ideas, make so much sense. Simple things like “Finish the work” and “No one cares what you’re ‘going to write’ only what you have written” — the point being that the thing you’ve not yet written doesn’t actually exist, so people can’t evaluate it. “Start,” it all makes such wonderful sense. His positive encouragement and forthright honesty is quite fantastic. His sensible and achievable down to earth advice is amazing and he has the whole room enrapt, and indeed it is compelling, I am wondering myself about the idea of a story, and how, well, I haven’t actually followed his rules and sure isn’t it a wonder that I am nowhere near writing it. He offers five rules of writing which somehow seem very basic, but with consideration filled with crucial points. It is a wonderful programme item, and I really enjoyed it. Overall feedback at Octocon is that the programme is exciting and interesting and indeed, I note that I am challenged for choices. The programme booklet is visible here. 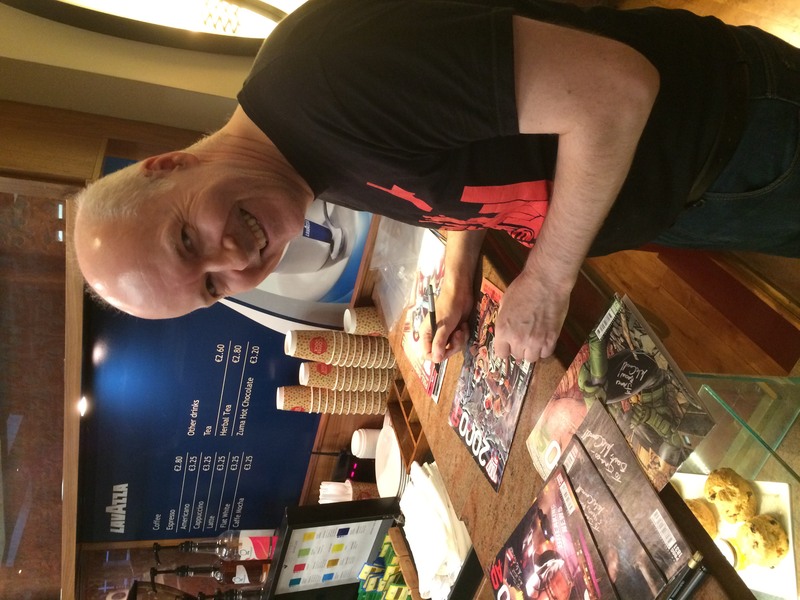 I get to meet Paul Trimble who runs Enniskillen Comic Fest [Facebook link]. I am looking forward to this event next year, and really enjoyed it this year and it is vital for the Dublin 2019 team that we connect across the country here, and Vanessa from promotions is chatting with Paul, as well as the team from WexWorlds. The chat and laughter never stops, and it is just brilliant to be home. This is home you know, my science fiction fannish home, my first convention, my first piece of purchased artwork, my first book signed, so many firsts happened at Octocon for me, and it is a vital part of my makeup and I love it. It has had many venues, shapes, committees and guests, and now in its twenty-seventh year, it is an amazingly well spirited and friendly convention. The attendance includes a lot of new fans. Indeed, I smiled when Janet pleasantly informed me that they ran out of ‘first time attendee’ ribbons when they gave out their 42nd, such a science fictional significance. 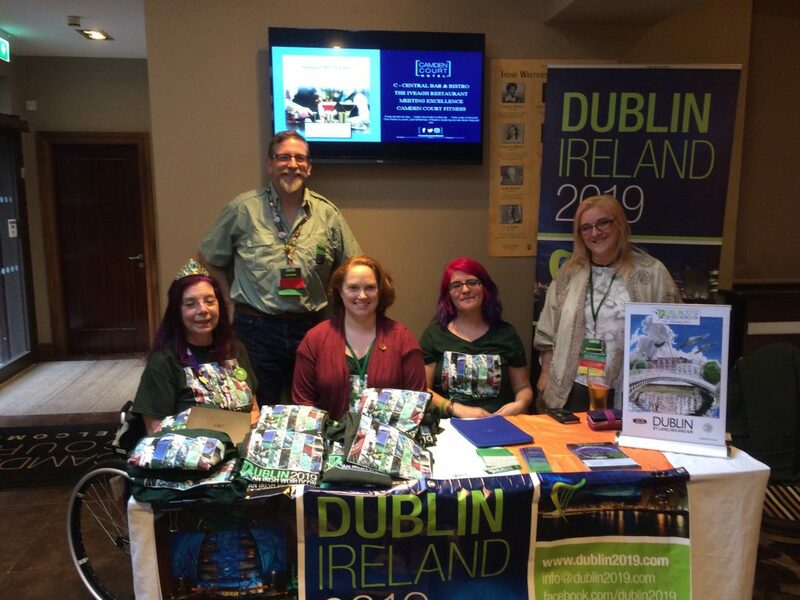 The feeling of celebration continues as the Dublin 2019, An Irish Worldcon promotions team of Vanessa May, Marguerite Smith and Sara Felix have worked closely with Janet O’Sullivan chair of Octocon and the team and so have sponsored the nights entertainment here. The promotions team have a new Iain Clarke poster, which I really like, and magic green wands that are multi-functional, and so the evening’s entertainment has a theme. As the dancing continues, the Octocon arrange Guerilla DJ Phil Dyson to extend the disco into the early hours, alleging that a ‘post party, party’ is occurring during clean up and so dancing continues, and indeed the music by Phil is excellent. I attended a Fan Fund discussion and was well pleased to engage with Fia Karlsson the current NOFF delegate from Sweden. The Nordic Fan Fund happily sending Fia here to Dublin. Previous fan fund winners Tobes Valois and James Shields engaged with loser Douglas Spencer under the keen moderation of Fiona O’Sullivan. I made good mention of bursaries and other elements that are out there to help fans. 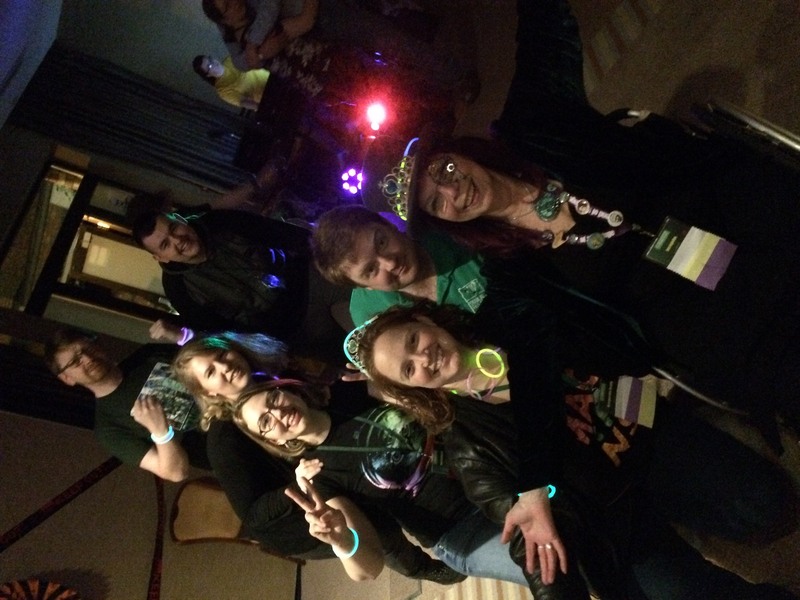 Listing off future cons is a thing at Octocon, and David Ferguson of Irish Comic News and Carol Connolly listed all the events that would be taking place in the next twelve months and beyond. Much mention was made of many cons including the Dublin Comic Con which got a lot of positive comment and was nice, I had to miss this years one, Dublin 2019 had a strong presence with other cons, handing out thousands of free books and comics as part of an outreach initiative.(http://forbiddenplanet.blog/2016/dublin-comic-con-report/). There is quite a lot going on in Ireland right now. 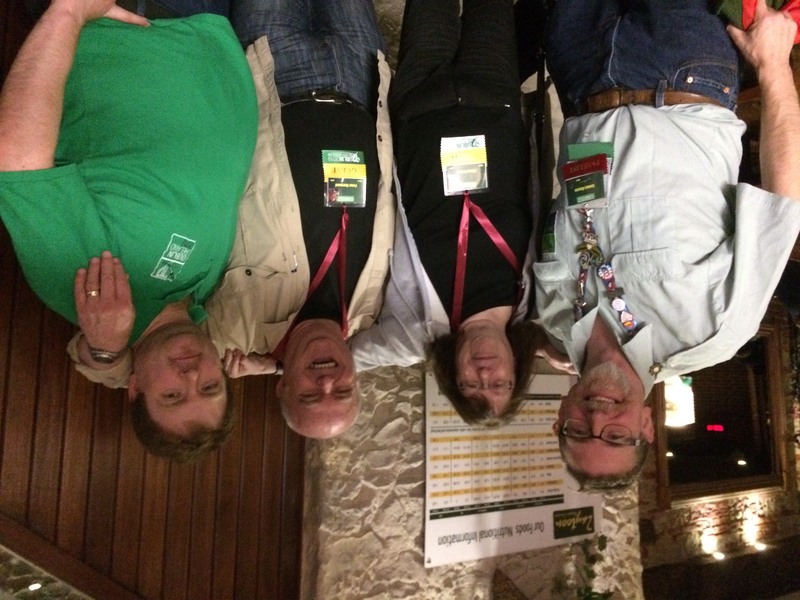 Future vista of conventions and events in Ireland is positive but it was a special moment as Carol skipped forward a little bit to August 2019. I was courteously allowed some time to speak at the closing ceremony, and thanked the Octocon Committee and previous committees, as well as the members. They, a huge amount of people have been collectively hugely supportive. It was five years ago that I stood up, and the chair asked for recording devices to be turned off, and shared the secret that a Irish bid for a Worldcon was in the offing. Now to thank everyone as we are a seated Worldcon was an amazing thing. 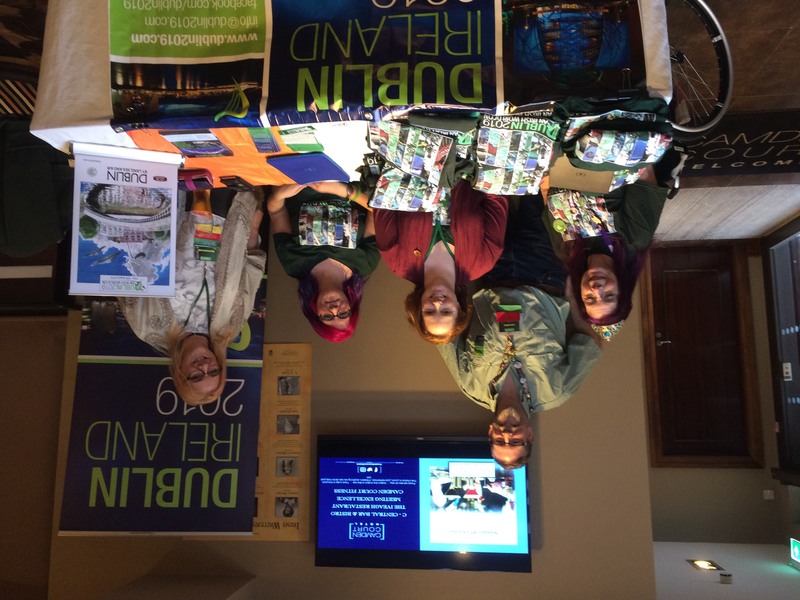 I made mention of our ‘First Worldcon’ rate of €100 and also of the Fantastic Dublin Fund, which is there to help people who need some help. I said that it would pain me greatly to work on something like this for many years, to find that some regular fan, just could not get to it. My sentiments were noted, and as I finished off by thanking everyone, my brief moment at the top of the room ended with ripping applause and cheering. A good bunch here, the noise from the closing ceremony was rapturous at the right times, that is for sure. I’ll be heading to the con next year of course, although a venue change is on the cards, and dates will need to be confirmed, but at the end of the closing ceremony, after Janet had announced this news, the queue to join up for next year, was as long as ever, if not longer. The evening continued, and later I found myself introducing many foreign fans to a ‘Spice Bag’ later at my Mom’s up the road on Black Horse Ave, ending the evening with a unique Dublin dish, and more talk, everyone having loved the con. Seven Spice bags please! I admit it, I missed so much, The Blasters, the Vault of Horror, the amazing Guests of Honour, Dan Abnett and Nik Abnett, the variety of guests, the wondrousness of home-made foods in the dealer’s room, next to great books and comics. There was so much, and all the while the spirit was fantastic. (3) PREDICTING THE PRESENT. In “The Celebrity Campaign” on National Review Online, Kevin D. Williamson summarizes William Gibson’s Idoru and explains why Gibson’s work is important for understanding the vapid, celebrity-driven campaign we have this year. 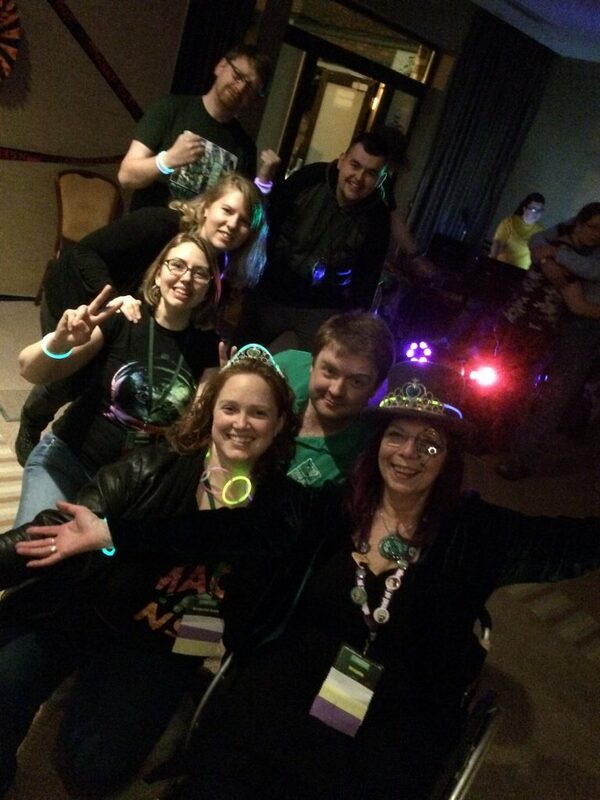 (4) OCTOCON. 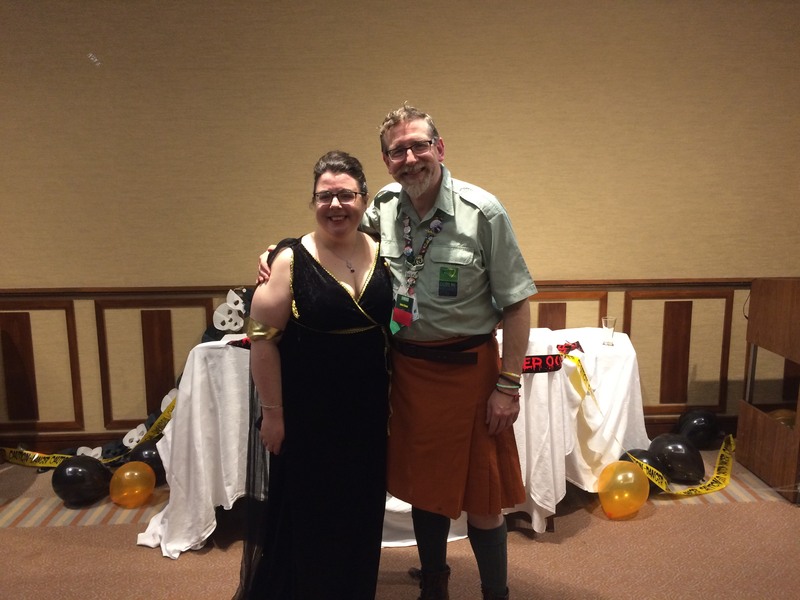 Forbidden Planet bookstore’s correspondent James Bacon easily mixes dance with journalism: “Science Fiction in Ireland: James Reports from Octocon”. 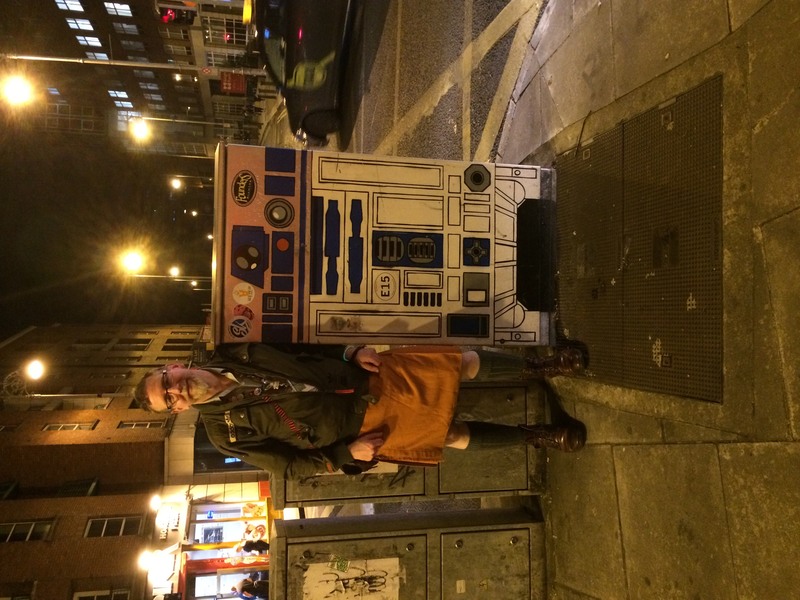 Even though I finished work at 5.30AM in London on a mild autumnal Saturday morning, within a few hours I was in the Camden Court Hotel in Dublin’s city centre, amongst friends and fans at Octocon. The enthusiasm and excitement then carried me through until I hit the sheets at 4.30AM on Sunday morning, fed by the energy of the convention, dancing well past midnight and imbibing great cheer. This year’s committee is youthful, bucking a trend with similar conventions in the UK, and possess a dynamism that brought together a nice programme, good fun social elements and of course overall a very enjoyable convention. The Guests of Honour, Diane Duaine and Peter Morward and Rhianna Pratchett, allowed much ground to be covered and attracted great audiences. With over two hundred people in attendance, the five-stream programme was busy. (5) SETTING THE STUPID AFLAME. This Bradbury-related tweet went viral. I love this letter! What a wonderful way to introduce students to the theme of Fahrenheit 451 that books are so dangerous that the institutions of society — schools and parents — might be willing to team up against children to prevent them from reading one. It’s easy enough to read the book and say, ‘This is crazy. It could never really happen,’ but pretending to present students at the start with what seems like a totally reasonable ‘first step’ is a really immersive way to teach them how insidious censorship can be I’m sure that when the book club is over and the students realize the true intent of this letter they’ll be shocked at how many of them accepted it as an actual permission slip. In addition, Milo’s concern that allowing me to add this note will make him stand out as a troublemaker really brings home why most of the characters find it easier to accept the world they live in rather than challenge it. I assured him that his teacher would have his back. (6) REMAINS OF THAT DAY. The demolition of Ray Bradbury’s house inspired Joshua Sky’s Omni story “The House Had Eyes”. The exterior was yellow with a brown triangle thatched roof and a thin brick chimney. The windows had been destroyed—the frames, like the living room, were gutted. Their remains tossed into a large blue dumpster resting on a hillside covered in dying grass. All that was left were two large cragged square shaped holes that bore inward yet outward all at once. Inward, laid the wisps of soot polished ruin. Hardwood floors, a mantle, masonry, some shelves and dust. Outward—the structure telepathically transmuted its emotions of loss and sorrow. She knew she was dying. I was transfixed, my eyeballs locked with the house’s. It was like something straight out of a Bradbury story! My hands tightly gripped the fence, chain-links dug into my finger tendons. Focused on the yellow lawn, my mind pictured a phantom montage of Bradbury, time-lapsed: Watering the grass. Reading on the steps. Puttering about. Stalking the sidewalks. Talking to the neighbors. Talking to himself. Writing. Staring at the sky. Staring at the stars. Staring beyond. 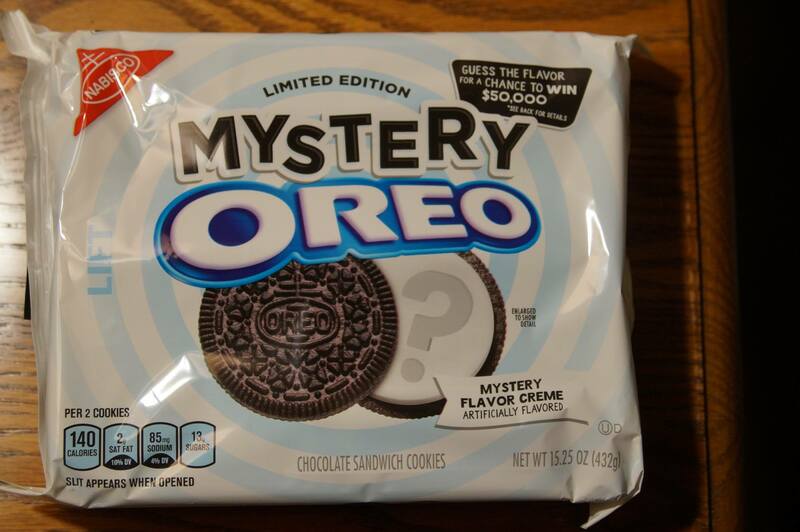 Marveling in awe. Downright dreaming—of rockets and Martians and technicolored time travelers. It all felt so cosmically unfair. Why’d they have to tear it down? Why’d they have to piss on a legacy? It felt like we were all losing something—even if we didn’t know it. That our country—the people—the vanishing literate—were losing not only a landmark, but a sense of our collective wonderment. That we were continuing a bad trend that had no hint of ending—swapping our heritage for a buck. That’s the American way some would say. Some—maybe—but not all. (7) FROM VELOUR TO MONSTER MAROON. With Halloween just around the corner, Atlas Obscura offers guidance to cosplayers: “How to Read The Secret Language of Starfleet Uniforms”. Luckily, Atlas Obscura is here to help, with a bit of cosplay codebreaking…. (9) NEW SF BOARD GAMES. In a piece on arstechnica.com called “Essen 2016: Best board games from the biggest board game convention”, Tom Mendlesohn reports from the International Spieltage convention in Germany, where most of the new board games have sf/fantasy content. One of the most buzzworthy releases of the whole show, this title sold out by 3pm on the first day—a whole hour before Ars even arrived. The one table that FryxGames ran with a playable copy was booked every day. Fortunately, Ars US staffers already got their grubby little hands on the title and gave it a thorough—and hugely positive—review. 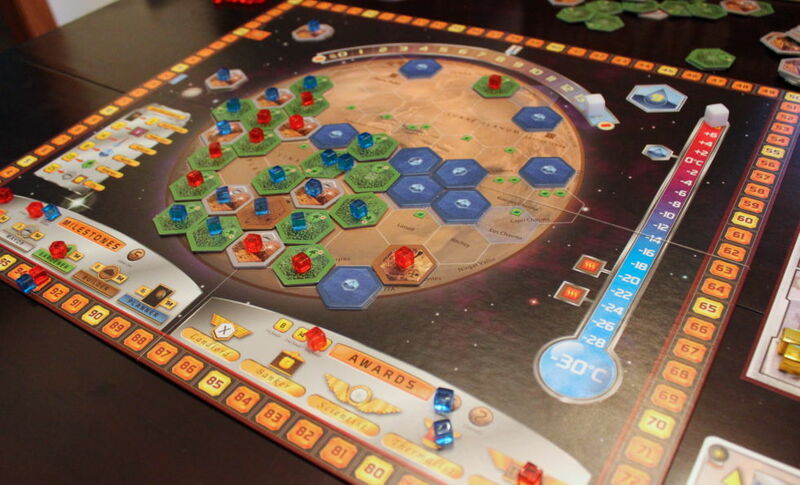 You’re playing as a futuristic global megacorp attempting, as the title suggests, to terraform Mars. Your tools are lots of plastic cubes, which track your resources and which are traded to in for asset cards, which get you more cubes. (The game is a total engine-builder.) Though the art isn’t terribly exciting, this is a terrific thinky Eurogame of interlocking systems and finding the most efficient ways to exchange one set of numbers for a higher set of numbers. (10) HE MADE IT SO. In a piece in the San Francisco Chronicle by Mike Moffitt called “The Real James T. Kirk Built the Bridge of the Enterprise – In the Sunset District” profiles a guy named James Theodore Kirk, who was born a month before Star Trek went on the air and who built a replica of the Enterprise in his house. He also is a Trekker who once won a chance to meet William Shatner, but he was dressed as the villianous reptile Gorn and wouldn’t tell Shatner his name really was James T. Kirk. Captain’s log, Stardate 21153.7: After straying into a wormhole, the Enterprise has somehow crash-landed on Earth in early 21st-century San Francisco. We are attempting to effect repairs from a location in the city’s Sunset District. James T. Kirk commands the Starship Enterprise from the captain’s chair of the ship’s bridge, conveniently located in the back of his house in San Francisco’s Outer Sunset. The bridge is equipped with a wall of computers blinking with colorful lights, a transporter room and the main viewer, which would toggle to show flickering stars, sensor data or the occasional Romulan or Klingon message demanding the Enterprise’s immediate withdrawal from the Neutral Zone. There is even an “elevator” in the back that makes a “whoosh” just like the one on the classic 1960s show “Star Trek.” Of course, the bridge is not an exact duplicate of the show’s — it’s a smaller area, so the key fixtures are a bit crammed and the helmsmen seats are missing altogether. But the overall impression is clearly Mid-century Modern Starship. (11) KUTTNER. You can find Stephen Haffner hawking his wares this weekend at World Fantasy Con. Or you can order online today! Haffner Press does it again! In 2012 we included a newly discovered Henry Kuttner story—”The Interplanetary Limited”—in THUNDER IN THE VOID. Now, with the upcoming release of THE WATCHER AT THE DOOR: THE EARLY KUTTNER, VOLUME TWO, we are pleased as pandas (!) to announce we have discovered ANOTHER unpublished Henry Kuttner story! MAN’S CONQUEST OF SPACE or UPSIDE-DOWN IN TIME is an early gag-story (featuring pandas) supposedly written for the fanzines of the 1930s. It likely predates Kuttner’s first professional sale in 1936. “And how can I get a copy?” you ask? Well, we made it simple. So simple that it’s FREE* if you place (or have already placed!) a PAID preorder for THE WATCHER AT THE DOOR: THE EARLY KUTTNER, VOLUME TWO. We’re printing a limited quantity of this new Kuttner story, so Do. Not. Delay. (12) KEEP WATCHING. Martin Morse Wooster recommends an animated short, Borrowed Time. The National Irish Science Fiction Film Awards, the Golden Blasters, were presented at Octocon in Dublin on October 11. The winners were selected from entries in the annual film festival dedicated to short science fiction, fantasy and horror stories. George R.R. Martin will be Octocon 2010’s guest of honor. The con takes place October 16-17 in Dublin, Ireland.